← Bye Bye Williston, FL! Hello Bainbridge, GA! Well, this was an interesting day (sort of). We had breakfast on board (only because the only restaurants in the immediate area are Subway and Hardee’s) and then headed out to the local grocery store in Sneads, FL about 5 miles away. 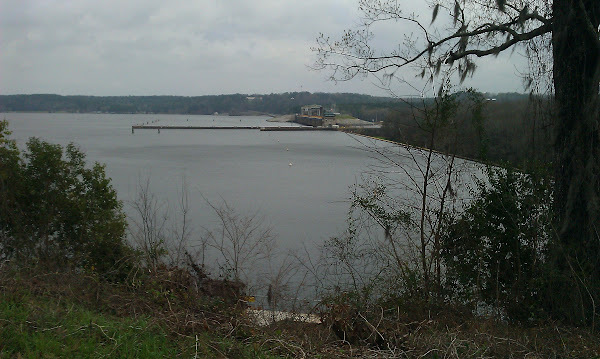 After picking up a few items, we headed back stopping along the way at the Woodruff Dam overlook. In the photo to the left, the dam and dyke are on the right, off to the left of the dam way across the lake is our campground. A few hours after we got back, there was a knock on the door – it was the campground park attendant telling us to turn on our TV because there w as a tornado watch and a severe thunderstorm warning for our area and that if we wanted shelter, the bath house was available (sounds inviting, eh?). Now hurricanes, t-storms and snow storms I can deal with but tornadoes not so much! We don’t get them very often in New England and seeing the devastation they can cause scares the heck out of me! And what would you do in a motor home anyway? 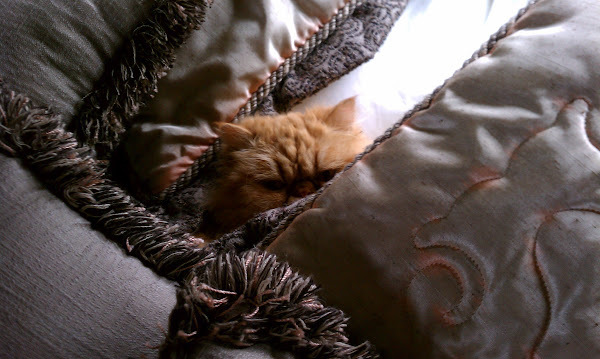 I was ready to hide under the covers with Sparky! When we turned on TV, the forecast was for the first wave of storm to be followed a short time later by another storm as a cold front approached. Within a few minutes, the wind kicked up to perhaps 45 – 60 mph, the motor home was shaking, the lake looked like an ocean due to the waves and the sky was a lovely ominous color. Rob quickly put the bikes on the bike rack on the back of the van so they wouldn’t blow away. On Thursday we had trouble with our awning going all the way back in, but due to the nasty wind and rain late yesterday, he couldn’t fiddle with it to see if he could get it to close properly. So he decided to go up on the roof to tie it down on both ends so the wind couldn’t catch it and ruin it. Good timing – right after he came back inside, the rain came – it was actually raining sideways! Initially the wind was hitting us almost full on the starboard side and bouncing us around a bit, but gradually swung around and thankfully during the worst of it was dead astern so there wasn’t as much windage at that point. Rob did go out once or twice and it was all he could do to keep the door from flying off and taking him with it – he thinks we easily hit 60mph sustained during the worst of it. Luckily we were on the south eastern fringe of the system so it wasn’t as bad as it could have been – we didn’t even get any thunder or lightning but in the midst of it, we did lose power for about 2-1/2 hours. In between the first system and the second, the winds died down, the water became calm and the sun actually came out. Then it started all over again but thankfully the second bout didn’t last that long. It was relatively warm and humid this morning with temperatures in the high-70’s. Now that the cold front has arrived, in the past hour, the temp has taken a nose dive so it is now about 64 degrees. It is supposed to be in the 40’s tonight (BRRRR!) so our snuggies will once again come out of storage. And I thought New England had crazy weather! I guess this year, everyone is having crazy weather! Here’s hoping tomorrow will be a better and less exciting day! what a scary scare, tornadoes. I’m with you, Linda, they give me the hebe jebes. Besides going to the bath house, what else could have been done?